The year 2016 is so far a tepid year for Malta's film servicing industry, especially when compared to recent years which were jam-packed with international productions overlapping each other. The last 24 months saw sizable productions including Risen, The Dovekeepers, By The Sea, Thirteen Hours, The Lake, Assassin's Creed and The Mercy - all with substantial budgets ranging from $18m to $50m and all starring world famous actors including Angelina Jolie, Brad Pitt and Colin Firth. During this past influx there were times when producers struggled to find local crews and were forced to fly in a large amount of foreigners, obviously not without a cost impact to their budgets. Meanwhile the market forces arising from the strong demand for local crews only encouraged local crew rates to rise. Some would argue Maltese crews became too expensive as rates rose beyond inflation levels. Others argue crew rates simply needed to rise. Both perhaps have valid arguments, but when some rates rose temporarily by 25% it is hard to justify such a surge. Prices for support services had also peaked during these busy periods. But the sun was not to shine forever on Malta and what goes up sometimes must go down. This year large productions which considered Malta decided to shoot elsewhere, partly for creative reasons but some also raised cost concerns. There are various reasons why international filmmakers choose to shoot in Malta and there are also many factors why the island occasionally loses out. Often it is a case where the political instability in the Middle East compels producers to find a country that provides a similar look but with less political risk. Malta fits this bill perfectly. For example in "Munich" Spielberg used Malta to portray seven countries. The variety of looks and close proximity of locations, the financial incentives, the water tanks and the English speaking public are all solid reasons why filmmakers continue to consider the Maltese islands. However, aside from the versatility of its locations and the fairly unique water tanks, it is not difficult for other countries to beat Malta in other offerings. It is somewhat misguided to think Malta has a "strong film industry". First of all, this is a service industry we are talking about and not an indigenous film industry which is still in its infancy. Secondly, a country that can only provide 80% of a full 1st class crew and which can only cope with a maximum of two medium-sized productions at any one time, and which moreover has fairly limited cinema filming equipment, cannot be thought of as a "strong film industry". Malta will have a "strong" industry when the majority of the budget is spent on Maltese residents and Maltese services without the requirement to substantially employ non-residents and other services from outside its shores. On the other hand, lest we forget Malta is in fact a very small island. With it's size and population of 400,000 it cannot be reasonably expected to service too many international films at the same time. Some correctly argue that it fails miserably in the number of indigenous films churned out annually compared to similar sized countries, but size still matters a great deal when trying to build and sustain more than one first class and full crew for 12 months of the year. Many had great expectations when Tom Cruise (first from left) visited Malta to consider shooting The Mummy this year. Cruise abandoned the idea of Malta when better offerings were discovered in Africa such as the desert. It is not uncommon for governments to occasionally question or revise their own financial incentives being granted to foreign producers. However politicians should never underestimate the amount of employment generated and the "multiplier effect" that foreign film money can generate in a country's economy. When filming in Malta producers receive a rebate of up to 27% for cash spent in Malta in local or EU services and crew. Having several productions shooting or prepping simultaneously is not conducive for the local film servicing industry which simply cannot cope at times and which drives film budgets higher due to the increased foreign contingent being hired as well as the natural result of local market forces. However it would be suicidal for Malta to "cherry pick" productions and be subjective about who should receive financial incentives. Producers need to continue knowing in very early stages whether Malta's doors are open to all and with no rules being uncertain or selective in any manner by any board or committee. Meanwhile one possible solution is to revise the financial incentives so that the rebate is capped in a clear and simple manner for large feature films whilst low budget films and episodic television have their rebate boosted. Ideally Malta hosts more low budget films and especially episodic television of all budgets. These type of productions provide consistent work to local crews. It is unrealistic to expect mega budget Hollywood films to reach the island's shores in a back to back fashion. Furthermore episodic television gives crews a better opportunity to grow their skills and get promoted on the same production. The regular employment and skill improvement of local crews is integral in preventing them from switching careers and moving out of the industry altogether, sadly a common occurrence in Malta whenever the trend of foreign filming experiences a prolonged dip. Despite the tepid year for Malta the future is not bleak. Already two serious productions have set their eyes on Malta for 2017. The financial incentives and the film-friendly approach of the government and the Malta Film Commission helps to keep Malta on the map. Moreover the PCP will be heavily promoting the island of Gozo as a stand-alone location rather than a complimentary location to Malta. An informal discussion between the PCP and the Ministry of Gozo has already begun in order to find means of making the island more financially attractive to foreign filmmakers. One idea floated around is the increase of incentives for productions filming substantially in Gozo. Following PCP's attendance last month at the Cannes Lions Festival it is hoped that a new wave of commercials will hit the Maltese island's in the near future. One small commercial will be filmed in Gozo as soon as next month. 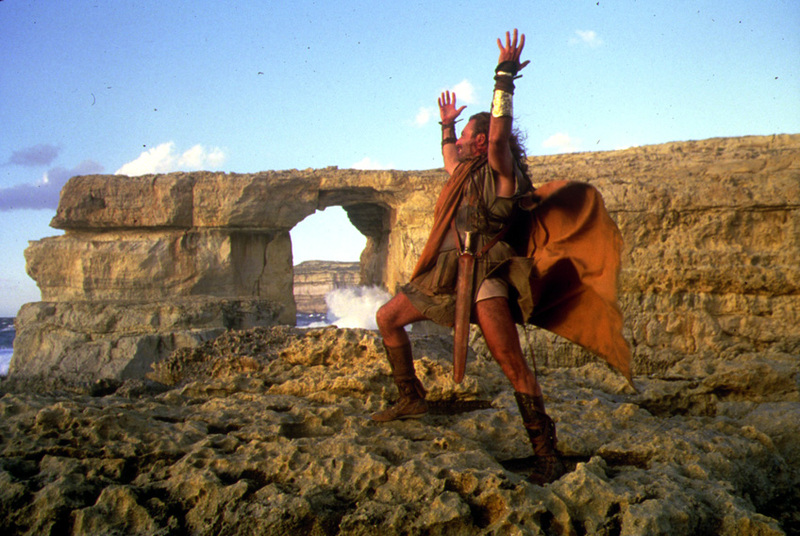 Armand Assante, star of The Odyssey (1997), is seen here at the Azurre Window of Gozo. The island is lavish with countryside, cliffs and characteristic streets. The PCP hopes to find Gozo a bigger role in upcoming film shoots.